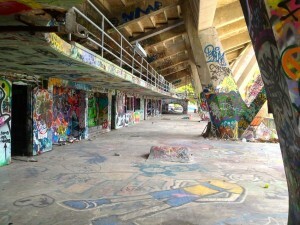 One thing Miami Marine Stadium doesn’t need: A coat of paint! This week the National Trust for Historic Preservation and the Friends of Miami Marine Stadium organized a tour of the MiMo monument, led by the Stadium’s architect, Hilario Candela. Curbed Miami’s photo gallery, taken during the tour by editor Sean McCaughan, shows that graffiti writers find the Stadium hard to resist. In its present state Miami Marine Stadium has a certain tropical-decadent-urban allure; it’s like a very forward-looking Mayan temple, giving way to the spray paint of the urban jungle rather than the encroaching foliage of the Central American rainforest. And one can’t deny it: Candela’s forceful geometry defies the ravages of time. In other Miami Marine Stadium news, the National Trust for Historic Preservation’s blog recounts Frank Mercado-Valdez’ story of producing the Miss Collegiate Black America Contest in 1985. Keep an eye on Learning From Miami for future posts highlighting Miami Marine Stadium at an earlier phase of its development. This entry was posted on Saturday, July 6th, 2013 at 12:36 am and is filed under Photo Galleries, Uncategorized. You can follow any responses to this entry through the RSS 2.0 feed. Both comments and pings are currently closed.